The pound is taking a turn in a new direction with vertical notes. What will be the only sterling bank notes of upright orientation in circulation are being printed by Ulster Bank. The polymer £5 and £10 notes will enter circulation in Northern Ireland next year. Ulster Bank, which is part of Royal Bank of Scotland (RBS), has released the designs of its new notes, which will replace its paper currency. They are based on the theme "living in nature". The £5 note features Strangford Lough in County Down and Brent Geese. 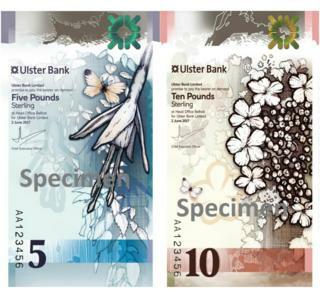 Its £10 denomination shows Lough Erne in County Fermanagh, the Irish hare and Guelder-rose shrubs. The bank announced last year that it would be following the Bank of England by printing plastic money. However, Ulster Bank is going a step further with the new format. Switzerland and Canada (who will introduce a vertical $10 note later this year), are among the few countries that have notes which are vertical in orientation.